The name of their company makes a lot more sense when you consider the fact that many years ago, American Express once delivered packages across North America. It was the middle of the 19th century and John Warren Butterfield drove stagecoaches across New York State. Eventually Butterfield teamed up with a couple of freight agents on his route, Henry Wells and William Fargo, to start a package delivery service they called American Express. Wells and Fargo eventually wanted to run routes all the way to California but their idea was rejected by the other decision makers at the company. The pair left soon after and began Wells Fargo & Company, ultimately forming the early industrial backbone of the United States in the process. Of course, it’s been a long time since American Express and Wells Fargo, now two of the world’s largest financial organizations, knocked heads in the package delivery space. James Congdell Strong Fargo, a son of William Fargo, was running American Express in the 1880s when he took a vacation to Europe, his hands full of letters of credit from the most prestigious banks in New York City, but still found himself unable to cash checks abroad. When he came back to the United States he decided to solve the problem and created the American Express Travelers Check with pre-set denominations that would be accepted overseas. For this reason and more, it can be concluded that “AmEx” pioneered international financial consumer transactions to the point where the economy truly became “global”. 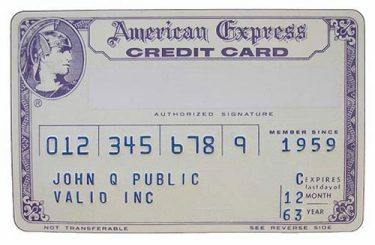 The American Express card, at first an actual piece of cardboard, finally came along in 1958 but they were quickly replaced by the world’s first embossed plastic cards. 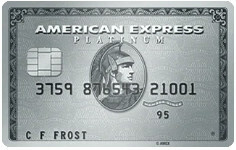 Many don’t realize that in the beginning the AmEx card was a charge card, not a credit card. Balances could not be carried over from month to month and they were required to be paid in full upon receipt of the bill. The company did not just issue cards freely, you had to pay for a membership, which of course brought with it a host of other benefits in addition to the “convenience card”. American Express charges much higher fees to merchants than other credit cards – roughly 4% per transaction versus 1.5% for Visa and MasterCard. For this reason alone, many online casinos choose not to accept them and only offer the competing cards. The rationale that AmEx gives for the discrepancy in cost is that since cardholders choose to pay for a membership, they must have more money and aren’t as much of a credit risk. They basically try to build an aura of prestige around their card that supposedly washes off on merchants. The logic that would then follow is: “online casinos that accept AmEx can be assumed to be reputable operations that are courting high rollers”…or something like that. However, finding a website to gamble with American Express in the U.S. is very hard to do: the operators just aren’t sold that the “elevated perception” of their company for offering the card is worth the increased fees. Especially now that we’ve entered a new age and most players want to deposit at online casinos with Bitcoin or other Alt Coins that are quick, cheap, and guarantee total privacy. So once you find a website that takes American Express you should be very thankful because there aren’t too many of them left out there. Offering the historic card takes a lot of time and expense and operators would rather devote those resources to adding the next big cryptocurrency, (whatever that is). Once you’ve signed up at a casino that accepts AmEx, the deposit process should be relatively quick and painless. Of course, this is assuming that the financial transaction isn’t flagged by the security team at American Express since they are one of the main deposit methods that were affected by the UIGEA legislation that made processing money to gambling websites illegal. They’re firmly on record saying that they don’t want to be in the betting business and they work hard to avoid accidentally allowing deposits to go through on their cards. If you only have an American Express card in your wallet and you want to deposit at a USA online casino your options are going to be very limited. It will usually be smaller operations that accept AmEx because they have a lot less players in their system so they’re flying under the radar – they’re just not making that many transactions. Therefore, you wont see AmEx offered at heavy weight websites like Bovada or MyBookie, but you will find them in the list of deposit methods at smaller places like Jackpot Capital, GT Bets, and Sloto’ Cash. Don’t be alarmed if you attempt to deposit with an AmEx card and the transaction is quickly declined. They have one of the highest failure rates in the United States because they are very particular about where their card is used. If you experience a deposit failure immediately contact the casino’s customer service team and ask if they are able to process the transaction manually. If they can’t, you either have to go somewhere else to play or use another method. Once you’ve successfully deposited at a casino with AmEx you will see a “descriptor” on your credit card statement that you will not recognize. This is absolutely normal and it’s because they don’t want to announce to the world that the funds were used for online gambling and get the transaction flagged. Therefore, you can look forward to descriptors involving anything from flowers, to bridal accessories, or even pizza delivery, and not ones that say “Red Stag Casino” or what have you. The bigger fish in the industry are always under a bigger microscope and 200,000 transactions in one calendar month under the descriptor of “Wanda’s Bridal Boutique” will be a flag to the credit card company and probably get their processors shut down. This is all just part of the business and it’s the #1 reason why online casinos in America now want you to use Cryptocurrency rather than your AmEx card. It’s just a better way to do things.